If you can't wait for spring, or you just love shabby chic and nature-inspired items, take a few minutes to put together a bird's nest candlestick. Made from simple wood pieces and a faux nest, it can hold candles, eggs, or the decoration of your choice. Don't be intimidated; this project is easy to make and can be painted to match your decor (you can even display it outdoors). Paint candlestick and base, and dry completely. Using wood glue, attach the round wooden base to the bottom of the candlestick, and the bird's nest to the top. Place a book or other sturdy item on top of the nest to press the pieces together. Dry overnight. Using the metal jump rings, attach teardrop crystal beads around the bottom of the nest (or accessorize as desired). 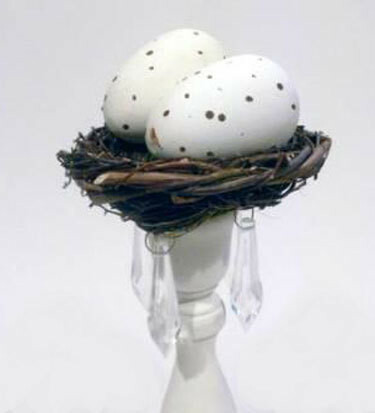 Fill nest with décor items, such as eggs, a small bird or a favorite collectible. To use outdoors: coat candlestick and base with wood sealant after painting, and protect from rain as much as possible.